really like the sausage flowers, ham flower and also the egg flower - very nice. @sherimiya : thanks a bunch Sheri! I'm OK now ... After suffered a lot from the blocked nose. I also learnt a lot from your bento, others bento and bento books. I hope you recover quickly from the flu! 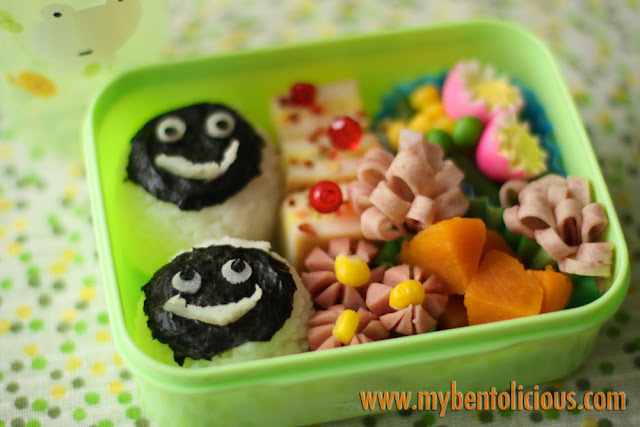 Beautiful bento, love the monster musubis stuffed with salmon! these nori monsters are so adorable! hope they drive the flu monsters away for u!